Let your child help. Delegating simple tasks to your kid is a great way to introduce responsibility and a sense of purpose when it comes to caring for the furry member of the family. Ask your child to help freshen the water bowl, or let her give the treats after a bath. In no time, your little helper will be sharing the responsibilities of caring for your pet. Be clear with boundaries. This one is big for making sure your family happily cohabitates together. Boundaries look different from family to family, so establishing your own will depend entirely on your clan’s needs. Just make sure you explain them in terms your child will understand (i.e. when Shadow is resting, she does not like to be touched because it startles her). Establish companionship. 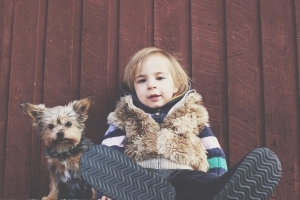 Creating pleasant associations with your child and pet will be key in showing them both how to have positive, warm feelings towards each other. Jealousy runs in both directions, so be cognizant of the sort of attention you give them in each other’s presence. What tips would you add? Please feel free to share in the comments!